Alto Mijares BTT Centre, located in the thermal city of Montanejos, has its meeting point in the Campuebla Apartamentos & Spa Complex which counts on its privileged position to enjoy the main attractions of the city, as for example the natural pools of the Mijares River or the “Fuente de Baños” Thermal Spring. Alto Mijares region is much more than just a river basin. It is a territory with a powerful personality. 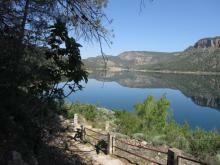 It stretches from the coastal plain limit to the high Mediterranean mountain through a rich succession of landscapes. The vegetation reflects the diversity of climatic and ecological conditions such as small riparian forests and lush pine forests of Aleppo pine, maritime pine and cork oak. The environment is incomparable because it is a mountainous territory which has a rich variety of landscapes near the National Park of Sierra de Espadán. 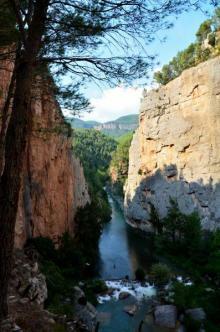 When you arrive at Montanejos, the Mijares River broadens in a small valley where you can see two huge canyons, the strait of Chillapájaros and the Ravine Maimona. It is important to mention that there is a big hiking path (GR-36), which goes from the Sierra Espadán to the Villavieja and the « Camino del Cid », with itineraries for « La Conquista de Valencia » (stages 46 and 47) and the « Anillos del Maestrazgo ». The BTT Centre offers 8 routes with a total tour of 266 km. The routes are interconnected, so users can choose their preferred option and discover with their bikes the landscapes and cultural value of Montán, Cirat, Arañuel, San Vicente de Piedrahita and Puebla de Arenoso. From Castellon de la Plana, take road CV-20 and from Valencia or Zaragoza take motorway A-23 (also called "Autovía Mudéjar") and take the road that goes to Jérica.